Whaddya Mean “No Sharing Platter?” – Are You Gonna Finish That? It was my cousin’s birthday over the weekend. Happy Birthday! I promise I won’t tell anyone you’re now 40. And in her traditional, last-minute style, we were given an invite to a restaurant gathering to celebrate her 21st. To give you an idea of “last minute”, this is the cousin that gave us five hours (not weeks, not days, hours) notice about the 10th birthday gathering for her eldest child. However, at least in this instance, we’ve been given a whole day. And it’s at Kervan. Like hell yeah! The last time I was here back in…. oh I wanna say 2016, or it could be 2015. Again, for a birthday. Mainly birthdays. If it is not for one of those reasons, then it is actually a bit of a mission to get them out. Let’s be straight, I was expecting to order a massive sharing platter. For me, just me. Keep your hands to yourself! Who said I had to share? Restaurants change their menus. That is a fact of a life. There are a plethora (heh, plethora, never thought I’d ever use that word) of reasons why. This can be sensible changes, like, removing the stuff you never sell to make way for new additions. This is a smart move. You keep all the good things you are known for. And you hopefully introduce your customers to something new too. All the while looking like you’re hip, trendy, and keeping up with the times. Maybe you just want to cull the menu and remove those items that just don’t sell (and for which you have to order in silly ingredients). This can even be slight changes like, how something is named. And then there are the changes that alter the image you want the restaurant to portray. Meaning presentation changes. …Square, black ones… along with chips being served in a bucket. Yes I know I know, I’m not a big sharer, but the point still stands that there is something special about ordering a mountain of meat. Like this, from the Medvedgrad Ilica Pub in Zagreb, Croatia. As it turns out, nobody, least the birthday girl, was actually aware of the changes in the menu. So what do you do? March out? With 12 or so people? You can have any brew you want… as long as it’s a Corona. – Dominic Toretto. The thing is, my complaint is relatively minor when compared to the food that was served. Bar a few wings, and pieces of chicken shish, everything else was annihilated. So we cannot complain about the food. Would I come back if invited? Sure, never gonna complain about grilled meat. Would it be my first choice, probably not. Mainly because just around the corner is the takeaway version of the old Kervan Saray restaurant. 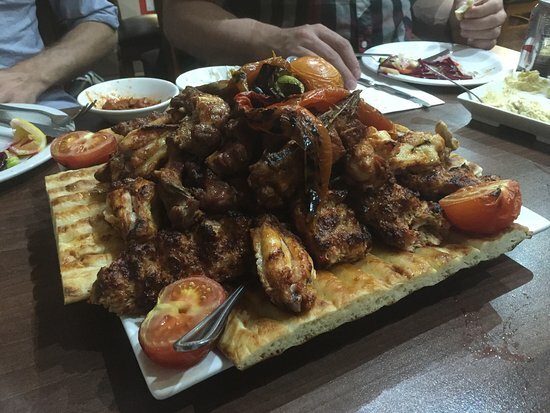 … and they do the sharing platter!! !